Three days until Thanksgiving! I am so seriously confused because we had an early Thanksgiving on Saturday for a few family and friends. I just got back from a run to Whole Foods to grab green smoothie essentials, and it took me a few minutes after arriving there to figure out why it was a complete madhouse at 3 PM on Monday. The gigantic display of yams and marshmallows front and center in the produce section alleviated any lingering confusion, though. That’s another topic in itself. Marshmallows? In the produce section? Of “America’s healthiest grocery store”, or whatever their new tagline is? Slightly disappointing, and I’m not the only one who thinks so. However, on the up side, realizing that I may soon have more leftovers on which to slather about 2 1/2 cups of delicious leftover gravy is the best news of the week. I guess that’s what I get for not making mashed potatoes, and for being such a sharing fiancee who has been resisting her innermost desires to chow down on the remaining serving of from-scratch stuffing. We snarfed that stuff(ing), if ever anything was snarfed. I try not to consider the fact that that single serving contains approximately 1/4 of a large loaf of crusty bread, or maybe I should focus on that to remove the urge to devour it. I don’t think that would stop me, though. After all, I ran today. If you’re in a last minute recipe hunting frenzy, I apologize for diverting you with the dialogue of my innermost food conflicts, but I still think I have something you need. Namely, these cashews, roasted in the oven until golden brown, then tossed with butter, a generous scoop of Kosher salt, cayenne pepper for a spicy kick in the mouth, molasses-y dark brown sugar, and the only herb I can name that actually tastes like a cozy winter evening by the fire. 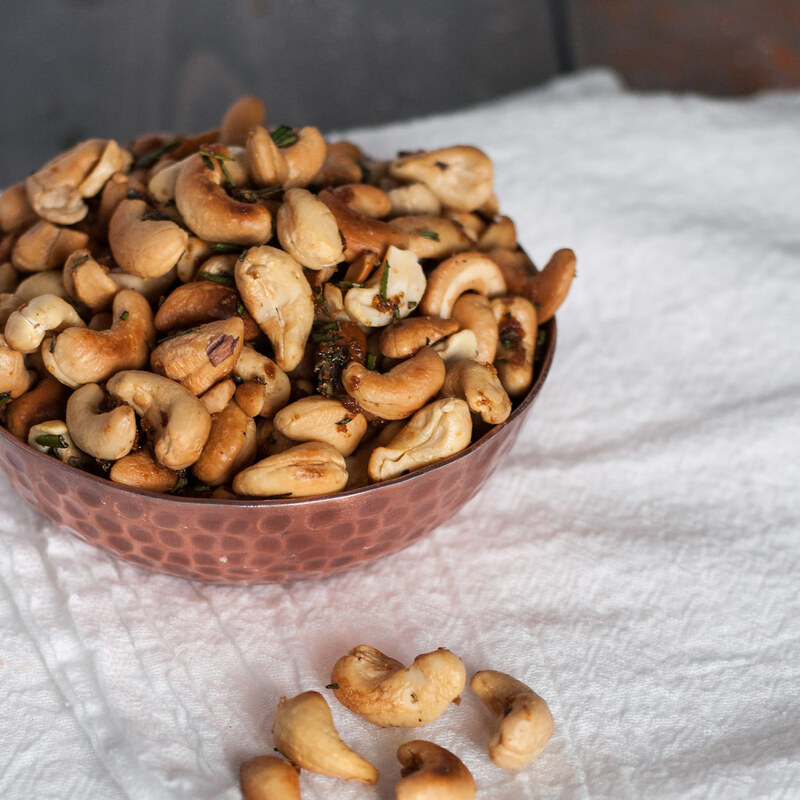 Yes, you should definitely get to know these cashews. I should warn you, though–you’ll be expected to present them at each and every gathering of three or more individuals, as I’ve been doing since I discovered the recipe on Food Network’s site. We all know that Ina has a way with food, making really common ingredients come together in a fanciful, sophisticated presentation and basically a flavor explosion. These nuts are no exception. Every time I witness someone taste one (or pop a large handful into their mouth), it’s followed by wide eyes, demands for the recipe, and bowl licking. Oh, wait, that last part is just me. For your regular party crowd, you’ll probably become accustomed to the “Are those the cashews?? ?” question. Whether you’re a 23-year-old hosting the Thanksgiving Eve rager, 30-something and responsible for bringing an appetizer to Thanksgiving Day, or an experienced dinner hosting veteran looking for an easy snack to quell the crowds while you put the finishing touches on the meal (or polish off a glass of wine in peace)–these are your nuts. 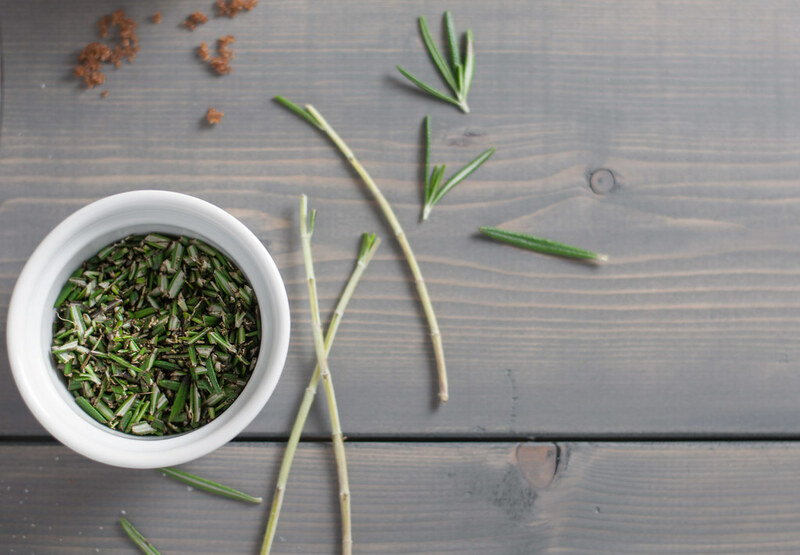 While rosemary is easily associated with winter holidays, I serve this snack at every single party or casual get together I host all year round. Wedding shower, July fourth picnic, New Year’s Eve, movie night, wine night, or Tuesday night…you get the idea. Be warned that it’s absolutely necessary to hide these (including from yourself) if you make them a couple days ahead of time. Ina suggests serving them warm, but I never do, and they’re just as good as freshly roasted. So stash them deep in the cabinet and just make a note in your phone exactly which cabinet that is, so you don’t stumble upon them four days after the party. That would not be ideal. Despite the added salt, I often use pre-roasted, salted cashews, which are really inexpensive at Costco, for the recipe. I think the existing salt actually helps the butter and mix-ins adhere to the cashews more securely after they’ve cooled. Recently I’ve been getting raw, unsalted cashews from Trader Joe’s (that’s what I used for the ones in the photos here), but they’re definitely more “slippery”, and you’ll find more chunks of lost rosemary and brown sugary butter at the bottom of the empty bowl (which, if you’re like me, you may try to eat). The choice is yours. Pecans or walnuts also work, but go so far as to double the quantity for all ingredients except the nuts. 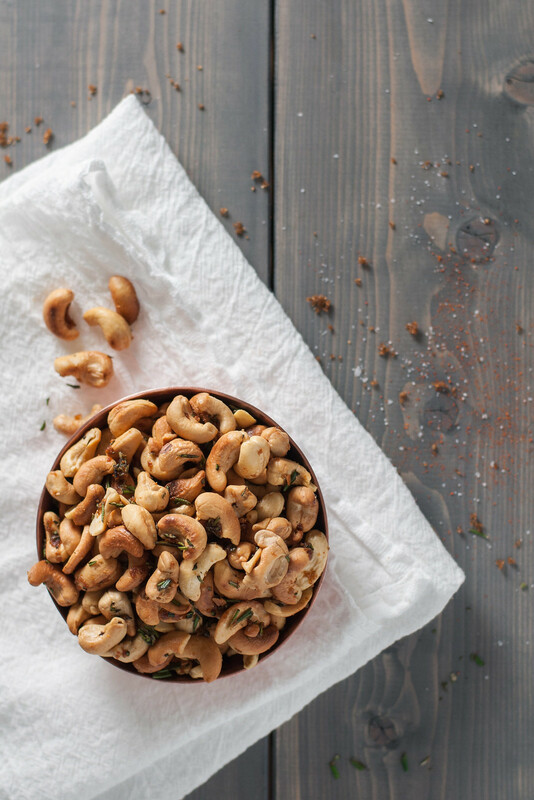 The smooth surface of a cashew has much less area than the nooks and crannies of pecans or walnuts, so more mix-ins are needed to get into all the crevices with enough flavor to counter a bulkier nut. After helping to deliver five big ol’ donated turkeys to a local organization in need tomorrow morning, I’ll be getting ready to post another go-to savory recipe for any last-minute appetizer needs you have. I may even whip it up for my own appetizer contribution on Thursday! Recipe barely adapted from Ina Garten’s Rosemary Roasted Cashews (inspired by NYC’s Union Square Cafe). 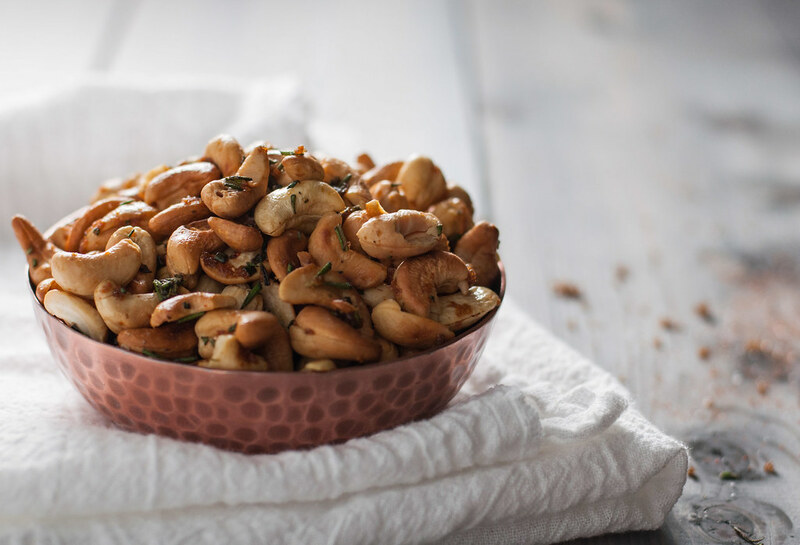 Make these cashews a couple days in advance for your next party. And your next party. And the next one after that. After you debut their explosive flavor, guests will request them again and again. 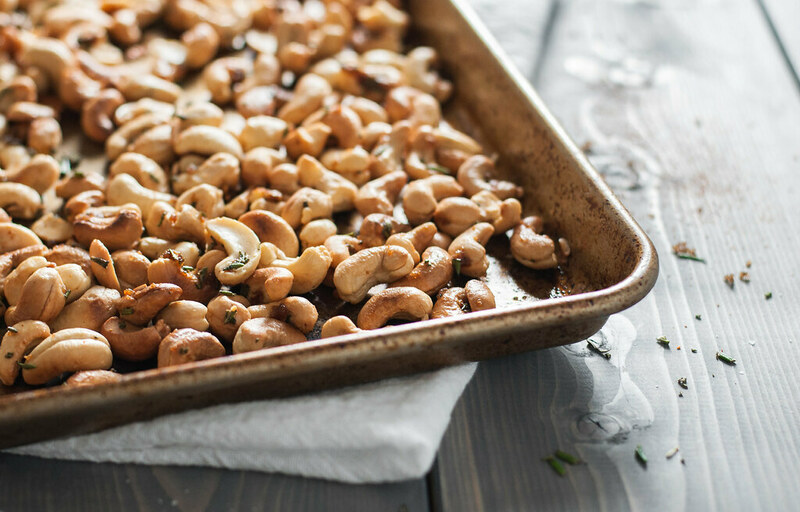 Preheat oven to 375 and spread cashews in one layer on a rimmed baking sheet. While the oven preheats and the cashews roast, you'll have plenty of time to gather and prep the remaining ingredients. 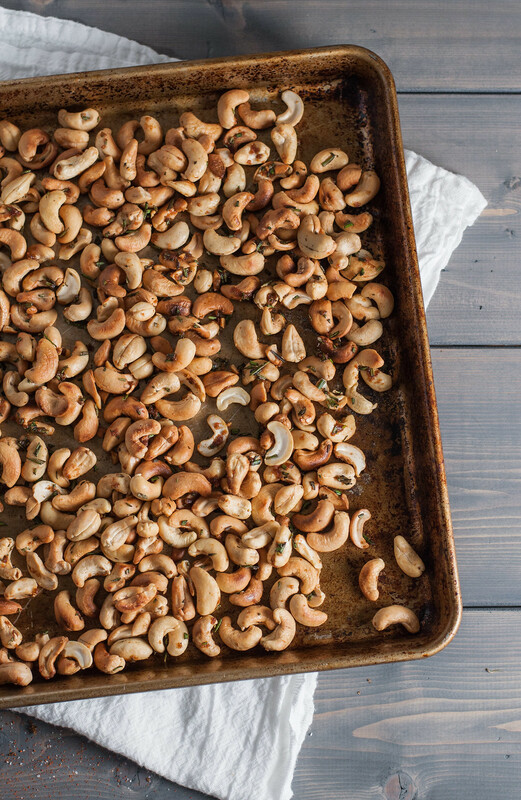 Bake cashews in preheated oven for 8 to 12 minutes, shaking the tray once halfway through. Raw cashews take slightly longer and should be light golden before taking out of the oven. Melt butter in a small dish in the microwave and allow to cool slightly while continuing. 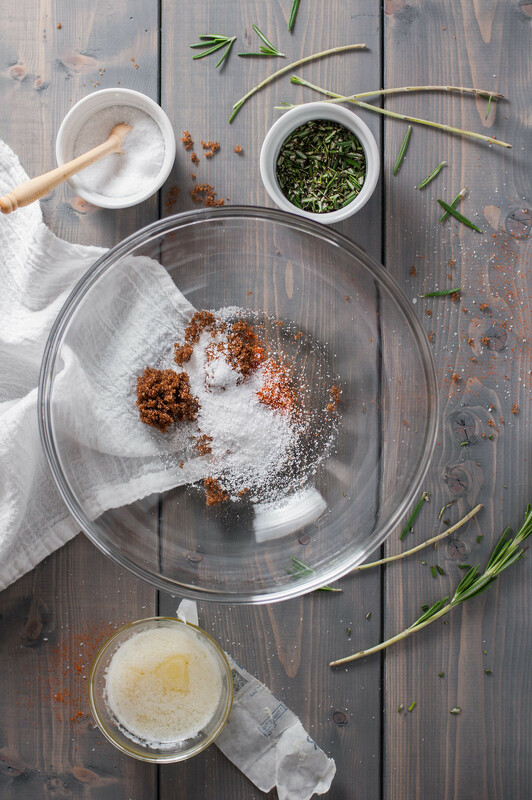 In a large mixing bowl, combine rosemary, brown sugar, cayenne, and salt. Right after taking the cashews out of the oven, add melted butter to the spice and sugar mixture and stir to combine, until the sugar is slightly dissolved. 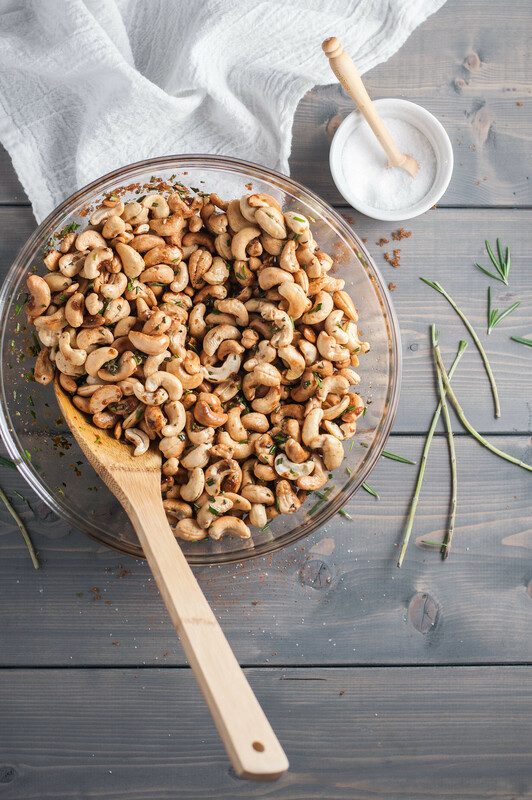 Carefully add hot cashews, and fold with a large spoon or spatula to coat cashews. Cool cashews in a single layer on a piece of foil or parchment. Serve shortly after, or transfer to an airtight container and keep at room temperature for a few days. Dark brown sugar yields a deep sweetness that isn't overly sugary, but light brown will substitute fine in a pinch. 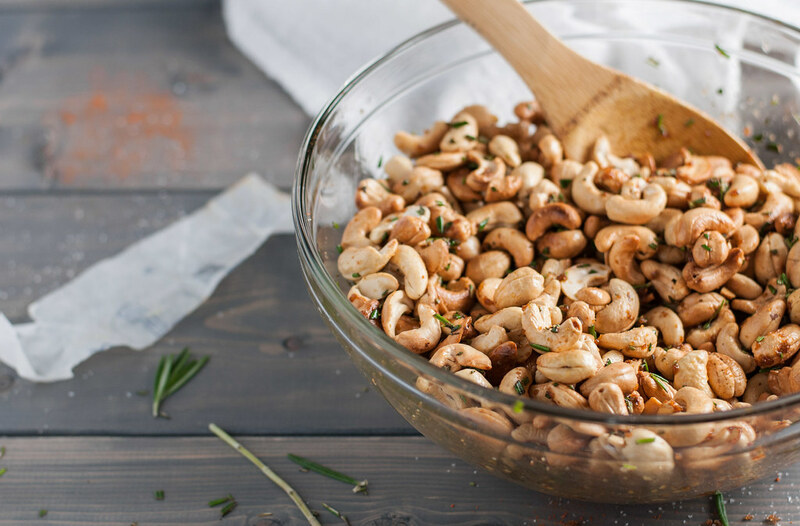 I love snacking on nuts so these rosemary cashews are definitely something I will be making. Thanks for sharing the delicious idea! You’re welcome! Try them on almonds, too, if you like a variety! With so many sweet treats around this time of year, I love to see someone posting about savory things. These cashews look wonderful! Marissa, I’d choose salty over sweet ANY day–give me chips, cheese, and these and I’m a happy girl. Keep up the fantastic piece of work, I read few blog posts on this web site and I believe that your site is rattling interesting and holds sets of excellent info . I’m going to make these tonight for my dinner party tomorrow night! Thanks! So excited to hear that–I hope the guests leave a few leftover for you! Mmm cashews are my favorite. I really like your next to the last one photo, great shot! I love anything Ina does! These cashews will be next on my list to try. I love your prose Tessa. Has anyone ever tried this with olive oil instead of butter? Honey instead of brown sugar?